For nearly thirty years now, you had three options when you were writing a screenplay. You bought Final Draft if you could afford it, Celtx if you couldn't and Microsoft Word if you didn't know any better. Six years ago, Highland gently eased itself into this market and now Highland 2 is a strong contender for being the best of them. 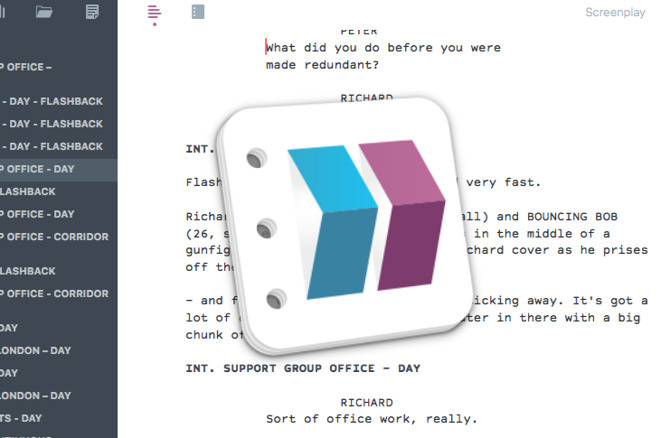 That's in part because it's had years of development by working screenwriters, but also because Highland 2 adds features designed to let you write both scripts and all the other associated documents other apps ignore. You can write your pitch document, your treatment, and your series bible right in the same app that you then go on to write the script in. What this means in practice is that Highland 2 is now as much a prose text editor as it is a script one so you could do your screenplay and then write the novelization in it too. It is still primarily a scriptwriter's tool, though, and you only appreciate why they need any tools at all if you try writing a script. After decades of film and television production, a couple of standard page layouts for scripts have evolved that you need to follow. They're clear, they're precise and they need to be this way for practical reasons, but actually writing in them is a chore. This is the layout used in the scripts for every film you've ever seen and the giant majority of television too. Sitcoms have evolved a slightly different form but it's still always a case of being clear what's a scene heading, what's description or action, which are the characters and who is saying what. Highland 2, Final Draft and Celtx all automate as much of this as possible so that you spend as much of your time on the dialog. 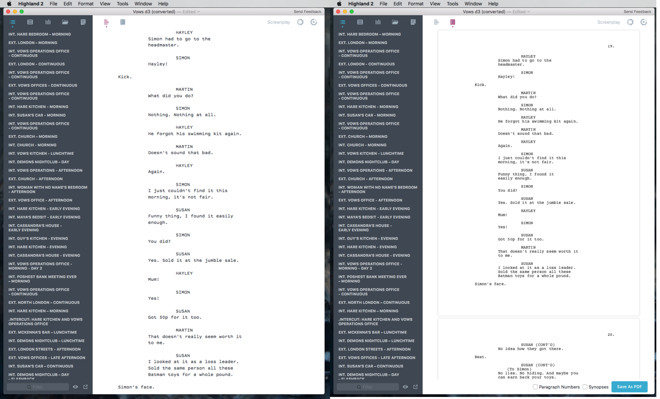 On the left is how Highland 2 looks when you're actually writing a script. On the right is the preview of how it will look on the page when you're done. It's not identical but it's very similar: you're getting the advantage of speedy formatting without having to remember codes or imagine how the final page will turn out. With Highland 2, the moment you type INT. or EXT. the app knows this is a scene heading and it sets that out the way it should. If you type a character's name in all caps, then hit Return and start writing regular text, Highland 2 knows that the first line is a character slug. It knows that you're now writing dialog. It's distracting at first as Highland 2 interprets what you're writing and moves the text across the screen to the right position while you're typing. Yet in an odd way, you come to like that: it feels like your script is alive and moving. Final Draft does much the same formatting but without the live alterations: it requires you pressing the right combination of Return and Tab at the appropriate time. When you first use Final Draft, the results feel so good that you think it's worth the keystrokes. If you're using Final Draft now then it sounds as if the differences between it and Highland 2 are preposterously small. They are. Yet after only a short while, Final Draft feels sluggish in comparison. Over the years of development, these automatic features of Highland have improved but what's actually new in this version 2 include the Navigator. This is an outline-like list of scene headings and notes that sits right alongside your script. It means you can skip to a scene with a single click or at most a scroll. It means you can see where you've left yourself notes anywhere in the script. It's only outline-like, though: it doesn't collapse sets of scenes into one and you can't reorder them. There's now also what's called a bin. That's a bin in the sense a movie editor would think of it —a place to store offcuts for later use —rather than the trash. You can select a line, a scene or any amount of text you like and drag it over to the bin. It leaves your script but it's still in the document so that you can retrieve it if necessary. It would be good if you could copy the text over to the bin instead of move it. Oftentimes you're reasonably happy with a scene and just want to see what it would be like with a few changes. For now you can't drag a safety copy over to the bin, you have to do some copying and pasting. Then there are new tools that feel like adjuncts to the main aim of writing yet which you may get addicted to. One is a Ulysses-like goal where you say how many words you plan to write and Highland 2 tracks that. It visually shows you the progress you're making toward that goal with a circle that fills out and changes color as you go. Complete your goal and Highland 2 displays a list of these achievements as milestones. Like Ulysses, though, it's not a count of new words added, it's a count of the total. So if you've already written 9,004 words and want to write 200 more you have to enter 9,204 as your target. Highland 2 comes with a new Gender Analysis tool. 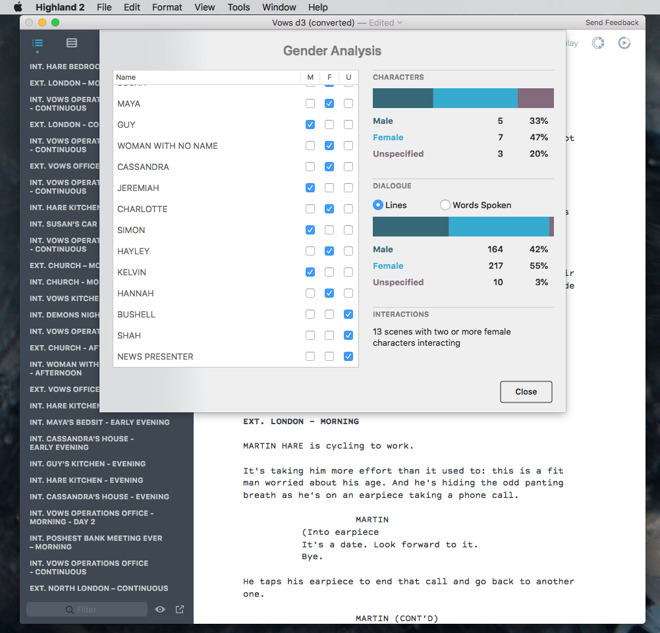 This shows you the number of men and women in your script plus it lists the number of lines or even words spoken by each gender. It also lists the number of scenes with two or more women characters speaking. It's not flawless. When we imported a Final Draft screenplay there was some oddity with characters being duplicated. Similarly, the list shows you names without any context and even though you created them, you can find yourself trying to remember whether someone is a man, woman or unspecified. It would be useful if you could click through the list to where the characters first appear. That said, it's a huge psychological tool, both for good and bad. For instance, you might think you're better than writers whose scripts are dull Boys' Own adventures but then Highland 2 says no, you're not. That's not a great feeling. However, when it says yes, you've got roughly equal men and women plus you have a dozen scenes with two or more women interacting, then you feel absolutely great. It doesn't prove you're writing something that's any good, yet it helps you feel you're creating real drama with real characters instead of just trotting out familiar old screenplay tropes. Highland 2 is one of those apps that you so enjoy writing scripts in that you're reluctant to move to something else even when you've got to create a document it really wasn't suited for. No doubt, plenty of Highland 1 screenwriters did some treatments and pitch documents in the app. Now, though, there are specific tools designed to help them. It's got templates for treatments —and also even for writing comic books —plus it's a Markdown editor. If you know and like that system, it means you can set chapter headings and the like without taking your hands off the keyboard to choose a style from a menu. Then the goal-setting feature works equally well for prose as for script. This doesn't turn Highland into Word or Scrivener, though. It lacks certain prose writing tools and one is odd: Highland 2 needs you to press Return twice between paragraphs where all other prose tools will insert that gap for you. However, what it gives you that arguably Word does not and certainly Final Draft doesn't is the feel of being immersed in using a modern app. That's no small thing. 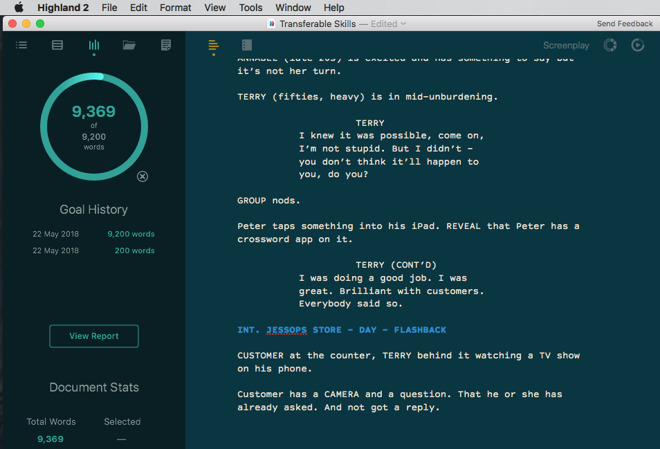 Final Draft has long been the industry standard for screenwriting but it's a cross platform app and always feels like an old Windows tool. Then its iOS version took a long and bumpy time to get here. That said, there is an iOS version of Final Draft and there isn't one for Highland 2. The makers are quite clear that they would like to do an iOS version but that there is a lot else they're going to add to the Mac app first. So for now, it remains Mac-only. It's also only available from the Mac App Store where it's free with an in-app purchase that costs $49.99. The free edition is a generous trial: there's no time limit and it is possible to write entire screenplays in it. You can save those scripts to PDF, too, though you get a Highland 2 watermark on each page. For your extra $50, however, you lose the watermark and you gain the addition of templates beyond the standard script layout. Those are how you really use Highland 2 for documents other than screenplays but there are also options for changing to various light and dark modes for writing in. The fact that there's no iOS version is a key limitation but you find yourself looking for excuses to write back on your Mac just so you can use Highland 2. That Mac will have to have macOS 10.12 (Sierra) or greater, though, and a 64-bit processor. So, any modern Mac will do fine.